When J and I moved to Kalamazoo almost five years ago, one of the first recommendations we got was from one of J’s co-workers for Papa’s Italian Sausage. Sad to say, that was one of the few recommendations we didn’t jump on right away. We just aren’t out on that side of town very often. Last Friday, I had to make a run out that way before heading to Grand Rapids for work. I was hungry and was thinking about stopping downtown for a sandwich or something. On my way back towards downtown, I spotted that little green building that I have drove by so many times without stopping. 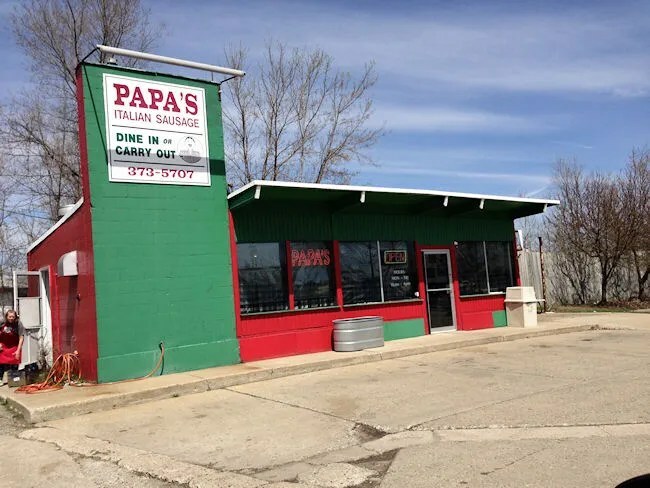 Papa’s Italian Sausage is on King Highway in Kalamazoo’s Edison Neighborhood just to the north of Crosstown Parkway near Mayor’s Riverfront Park. It’s easy to drive by unfortunately because the building sits kind of on an angle. Even coming from south, I had to hit the breaks a little harder than I should have to make it in the parking lot before driving by. The very tiny store has enough seating for about a dozen people or so and ordering is done at a window that is directly in front of you when you walk in the door. The menu was much larger than I thought it would be. I figured I would be pretty limited to sausages, but there is a huge sandwich menu. I started to order the Italian Beef sandwich even though I had it once before and wasn’t a super huge fan of it. It’s just kind of habit when I see it on the menu, but my eyes continued scanning and I noticed another sandwich that I can almost never pass up. Pastrami. I didn’t notice much in the way of sides that I sounded good at the moment. The Potato La Roma sounded pretty good, but it looked difficult to eat in the car. There was no option for fries and I didn’t feel like paying for a bag of chips, so I just went with the Pastrami Sandwich. The bill was near $6 and it took less than five minutes for the sandwich to be wrapped in foil, bagged up and handed to me. I needed to get on my way to work, so I didn’t open the sandwich right away. I stopped in Dorr to get gas and that’s when I finally unwrapped the sandwich. The sandwich was put together on a very hearty and flavorful sub bun. 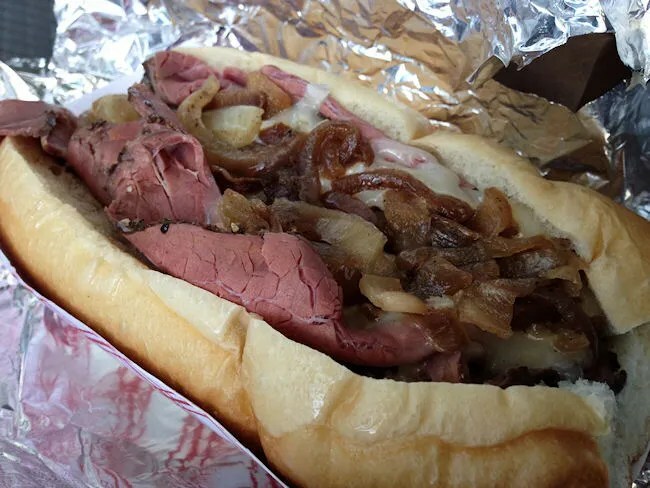 The bun was loaded with delicious, peppery pastrami, provolone cheese, grilled onions, and a spicy mustard. I didn’t really want the onions and I had no idea they would be there. The menu didn’t have descriptions of the sandwiches and the Pastrami sandwiches I usually get don’t come with onions. It really wasn’t a huge deal. The onions were big enough I could pull them, so I did. Once the onions were gone, the sandwich was very tasty. There was quite a bit of meat on the bun and the sandwich alone was a pretty hearty meal. 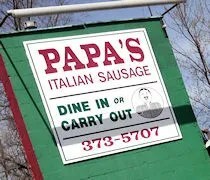 Papa’s Italian Sausage needs to be more of a regular stop for me. Their specialty is the home made sausage and meatballs which means that’s what I really need to try, but being that I was going to be eating in the car, I didn’t want anything messy. I do make my way out to that side of town every so often and Papa’s is a place that I need to keep in mind in the future.